I always enjoy Jennifer McGuire and Kristina Werner’s online classes and their Summer Card Camp 2 did not disappoint. This card used one of their sketch and color combos from week 3. I had just picked up the Sizzix Stamp and Die Set really cheaply at Michaels so this seemed to be a good time to try the set out. I stamped and die cut the butterflies out of white cardstock and colored them by tapping my Distress Ink pads on my craft mat and picking up the color with a water brush. I used the white cardstock purposely so that the colors of the ink would be true but I didn’t want the outer edges to be so white so I used the Frayed Burlap Distress Ink to color the edges. Much better! The sketch used twine to wrap around the center of the card but since I happened to have purple thread on a bobbin I decided to sew the lines on instead. My machine was not exactly behaving itself so the stitching is a little wonky but that’s the way it goes sometimes. I still like the result. I cut out a banner and swiped it through the puddles of Distress Inks to color it, dried it with my heat gun and then stamped the sentiment. 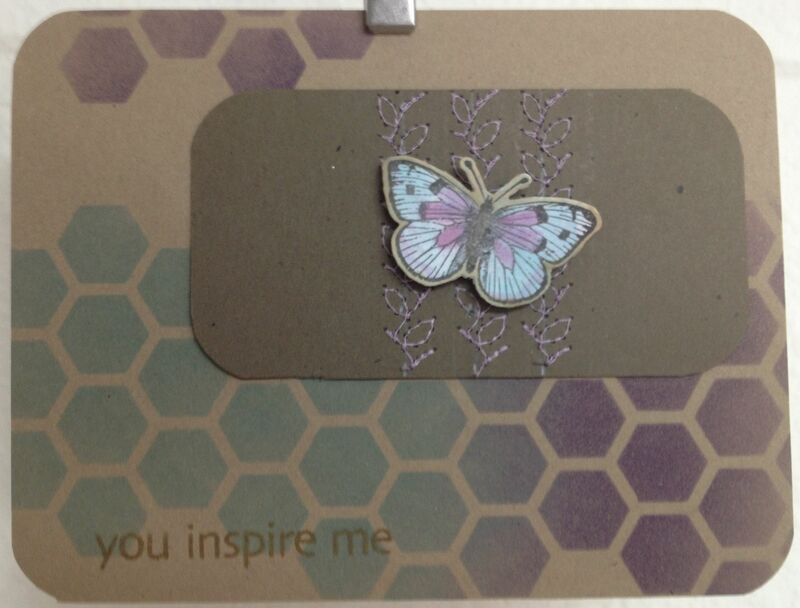 Both the butterfly and the sentiment were mounted on dimensional adhesives and then added some bling with rhinestones. As I said, my machine wasn’t exactly cooperating with me for the stitching so I ended up making two panels and then trimming them to get the best results. 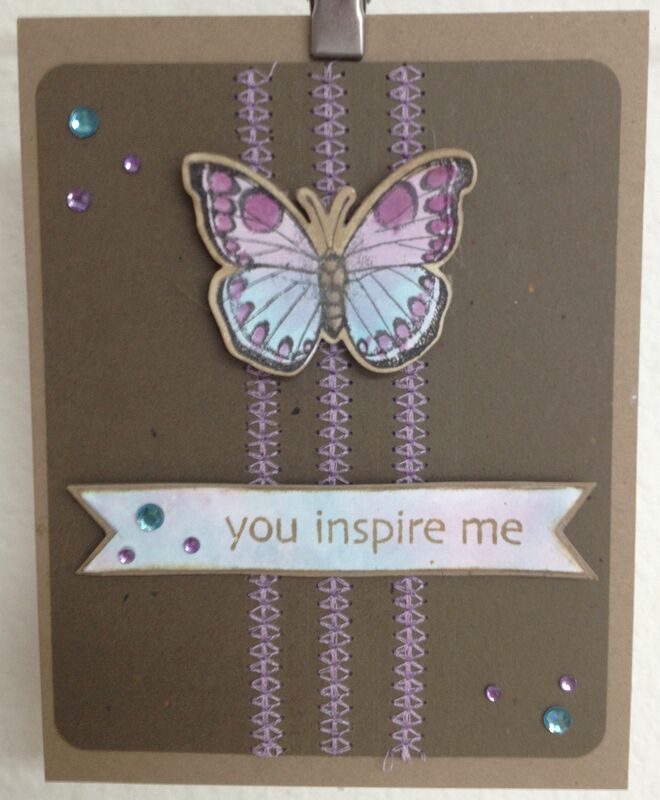 I had this small piece of embroidered panel left and another butterfly from the same Sizzix set so I decided to make another card. It was a “look into my drawer of stuff I haven’t used yet” kind of day so I pulled out my new Heidi Swapp hexagon stencil and used Broken China and Seedless Preserves to add color. I like the contrast between the hazy background and the not-so-hazy butterfly panel. They’re both beautiful. I love the muted colors on the neutral background. It’s such a classic look. And the sewing on the second card is lovely.